My FH wants to have a camo wedding. Any ideas??? Yep, tell him you are the bride and he can have a camo grooms cake and help you pick one of the colours of the camo for the girls dresses so that he can have a camo tie or vest. That way you can have an elegant earthy toned wedding without having a tacky redneck wedding, but he can still have little hints of camo. 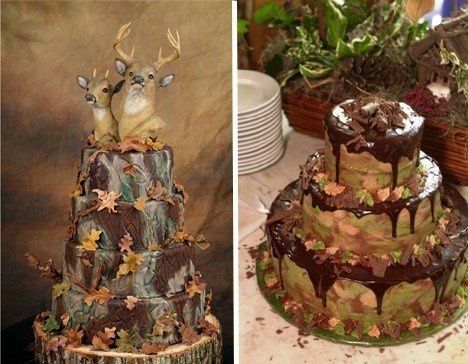 I agree with WasSoon2BMrsSmith, if you pick earth tones, he can have camo socks and a camo grooms cake - but I just can't imagine a full camo theme without it being majorly "redneck." 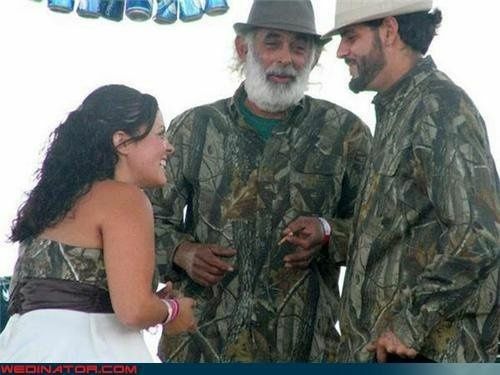 To me, camo doesn't belong in a wedding - just my opinion. @Celia - I see where you are coming from; though I don't agree that the camo makes reference to the school shootings. I don't think anyone would make that connection. I agree with MrsSmith. You do not want these to be your wedding. My cousin did hints of camo at her wedding a couple years ago. The boys wore camo vests and it didn't look bad. I think camo and psychos who shoot up a school have NOTHING to do with each other!!!!! 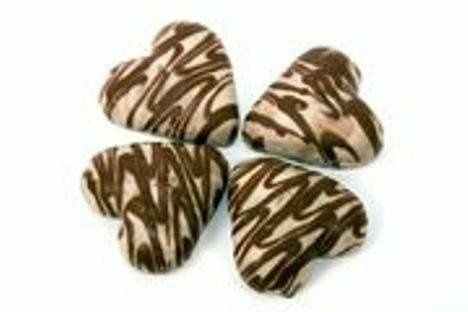 Here are some camo ideas (cake, garter, favors). Small things that will still bring in that camo without it overpowering the whole wedding. I don't think I have EVER seen anything in camo and thought it was classy, or anything but tacky... sorry. The only time I think it is acceptable in a wedding is when the groom/bride is a serviceman/woman and is in uniform (if they are even allowed to wear it outside of official duties). The camo garter above is ok.
Perhaps just have a colour scheme of green, brown, and beige and use them as block colours not camo. However, I must say that relating camo to the recent tragedy is nothing more than stereotyping. Do not assume that every gun owner wears camo or that anyone that wears camo owns a gun. Also never assume that a gun owner is a "violent individual". If I'm not mistaken, the killer was wearing black anyway. @Celia- personally you have just offended me. I watched my fiance get all packed up and head out this morning decked out in full camo to hunt. A person wearing camo and the tragedy that happened have NOTHING to do with eachother. You should think twice before making such an ignorant comment. I'll take it down; I didn't mean to offend anyone but it's not an ignorant comment. Anyone who knows me, even just from online, knows that I'm not even close to ignorant. 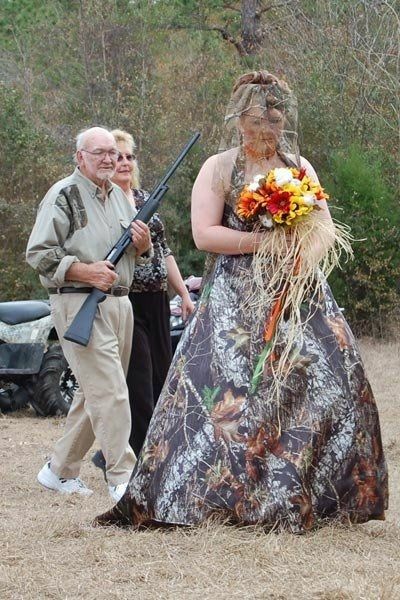 I like the idea of subtle camo in a wedding. I think that if it is done right it could look beautiful. 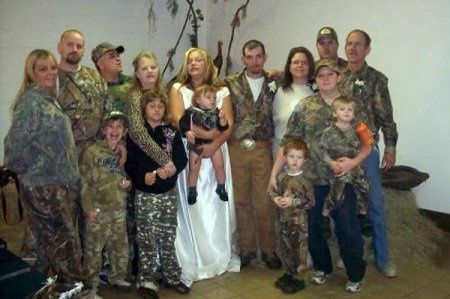 Camo garters, vests, and a small section of camo on the wedding dress can go a long way. Good luck!